"I just threw this together one day for a party where I knew there wouldn't be any sandwiches for us non meat eaters. Definitely not for the Vegan. 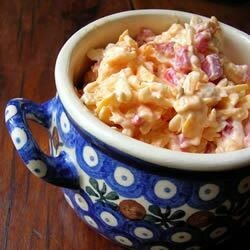 This is a quick and yummy alternative to store bought pimento cheese spread." In a medium bowl combine Cheddar cheese, Colby cheese, pimentos, creamy salad dressing, salt and pepper. Add more or less creamy salad dressing to achieve desired texture. Mix well. Southerners use real Mayo, like Duke's or Hellman's. this calls for more pimiento than needed, use half as much. Adding a little cayenne is great, too. delicious! a little heavy on the pimento's. next time I'll just use one jar. I also recommend running the pimento's through a chopper to make them a little finer.